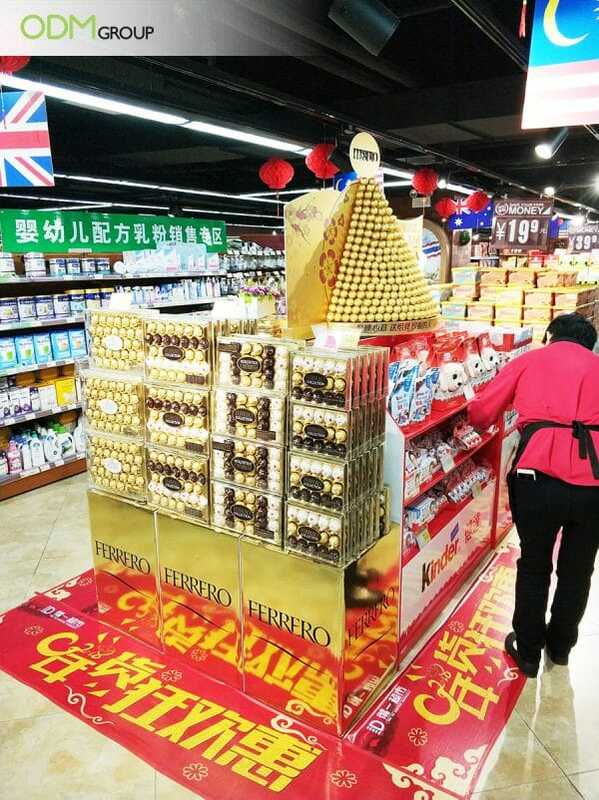 Ferrero just made Chinese New Year more exciting with their in-store marketing display. This was done last year in celebration of the Year of the Dog. Their in-store display is very fitting for the occasion. Moreover, the set-up directs the attention of customers towards their products. Arrangement of Products: The products are neatly arranged to create a one big POS display. At the middle is a pyramid-like stack of Ferrero chocolates, which resembles a Christmas tree. It sits atop two retail shelves that were placed back-to-back. Superb Product Packaging: Their custom retail packaging is something that businesses should learn from. Sturdy and elegant, the packaging design improves brand credibility and reliability. What We Learned From their In-store Marketing Display? 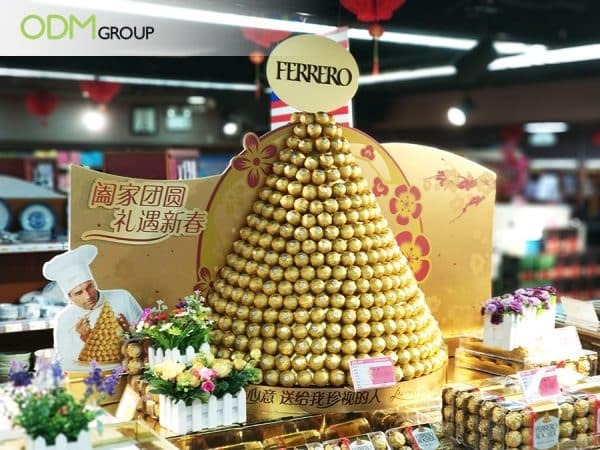 Tap Into the Culture: Although Ferrero is a western chocolate brand, they were able to capture the Chinese market easily. They joined in the fun of celebrating the Chinese New Year by using posters with Chinese characters and designs in their merchandise display. And this is important to bring their brand closer to their customers. Festival Promotions Increase Sales: Running a festival promotion can tremendously help increase your sales. During such important festivities, people are on the lookout for delicious food to put on their table. Often, they give food as gifts to their family members or friends. By running a festival promotion, you are making your brand relevant to customers. Use Appropriate Designs for Promotional Products: Aside from their eye-catching POS display, they also have a promotional toy to boot. 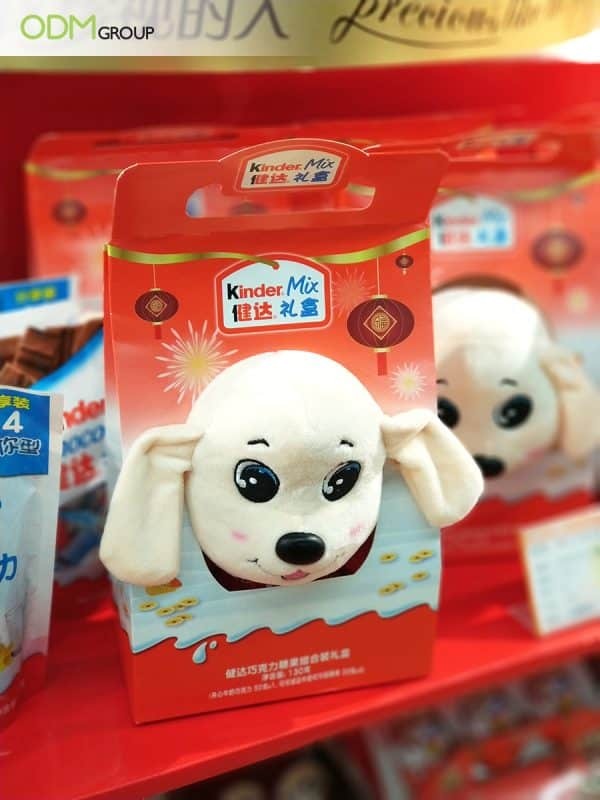 Kinder’s promotional plush toy is perfect for the Year of the Dog celebration. It’s effective in that it serves as a tangible souvenir from the company. Moreover, it becomes a wonderful collector’s item- because the Year of the Dog will come again after 12 years. The ODM Group can help with any of your promotional product needs. We specialize in designing, sourcing, and manufacturing of promotional items and POS displays. When it comes to POS display units, you can expect us to deliver high-quality and functional free standing displays, promotional poster design, outdoor advertising signs, and custom 3D signs. If you have a design in mind, send us the draft and we’ll help you turn them into reality. Or, if you want your designs made in-house, our team of designers at Mindsparkz will assist you from product brainstorming, to sourcing and sampling all the way through the actual manufacturing process. Also, we conduct stringent quality control to ensure that factory floors meet your design requirements. Speak with our team today! POS display for Christmas by Ferrero- what do you think? 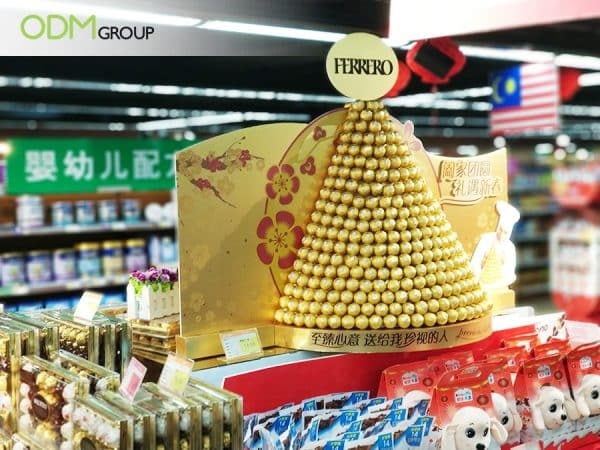 We definitely like this luxurious display by Ferrero and we feel like businesses can learn a thing or two from this example. Here’s one of the best CNY pos display we have seen so far. It’s from Johnnie Walker and the craftsmanship was truly awe-inspiring.